Why choose our Sysmarts TV sound bar ? Upgrading your home-entertainment system has never been easier thanks to this S9920 soundbar 2.0 Channel Bluetooth Sound Bar. The 38-inch sound bar combines superior audio with a sleek, slim size. Place it horizontally in front of your TV base or mount it below your TV, then simply plug it in and connect wirelessly to your TV for an incredible home-theater experience. It makes a sophisticated addition to any 40-inch or larger TV. while Bluetooth lets you wirelessly stream from your mobile devices, Amazon Echo or Echo Dot,etc. ☆38-Inch 80W Sound Bar for FLAT SCREEN TV: The wireless soundbar system works loud and clear with noise reduction bring you a wonderful media experience. Experience wall-to-wall expansive audio and pure,crystal-clear sound. 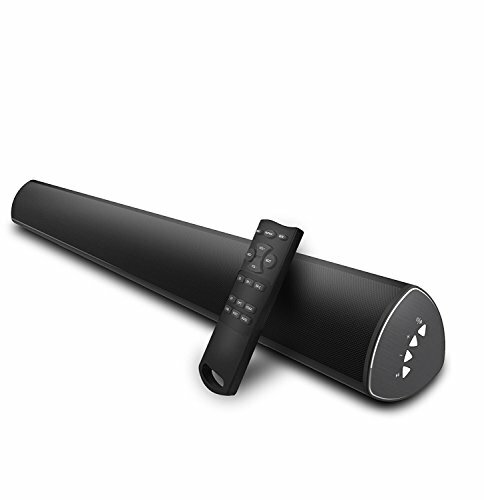 ☆MULTI-MODES for WIRED/WIRELESS CONNECTIONS - Sysmarts Sound bar, modern and traditional devices work with 4 connection modes: Bluetooth (effective distance:10 meters/33 feet),wired connections include optical / coaxial / AUX / USB inputs. ☆Ultra Slim, Sleek Sound Bar:With Most attractive Slim designs, the Sysmarts Sound Bar packs powerful sound in an ultra slim, proportionally elongated build. Whether you set it on the furniture below the screen or mount it onto the wall, the soundbar will match your TV's design and amplify its audio. ☆REMOTE CONTROL OR BUTTON CONTROL- Dual operation of bluetooth sound bar which offers high grade convenient one button control and a remote. We provide 18-month warranty and quick response & friendly customer service. If you have any questions about this product by Sysmarts, contact us by completing and submitting the form below. If you are looking for a specif part number, please include it with your message.